South African species C are found on this wiki page. 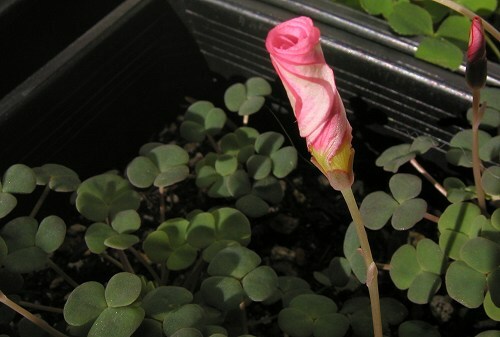 Oxalis callosa R. Knuth has trifoliolate leaves and rose-red flowers with a purple ring and a yellow tube. It is an especially beautiful South African species found on gravely soils from the Bokkeveld Mountains to the western Karoo. It blooms in the fall. Photo 1 was taken by Bob Rutemoeller, photos 2-3 were taken by Mary Sue Ittner. Photo 3 shows the bulbs on a 1 cm grid. Photos 4-5 were taken by Nhu Nguyen. Oxalis cathara Salter has large flowers on long pedicels. Photo taken by Nhu Nguyen. 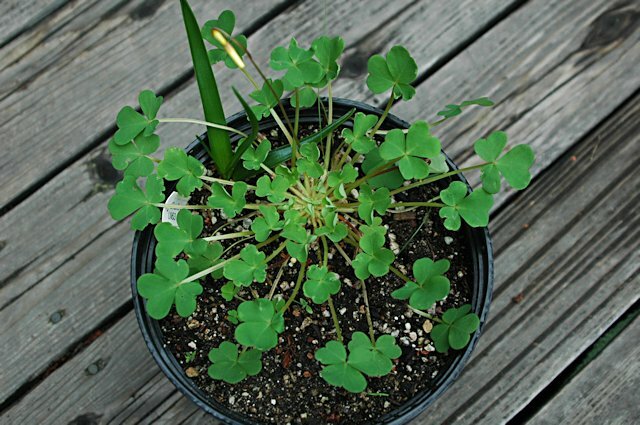 Oxalis caprina Thunb. described as a weed by some, grows from the southwest Cape to the Eastern Cape. It has trifoliolate leaves and 2 to 4 flowers lilac to white flowers per stem. It has a long bloom period. Photos by Mary Sue Ittner. The last shows the bulbs on a 1 cm grid. 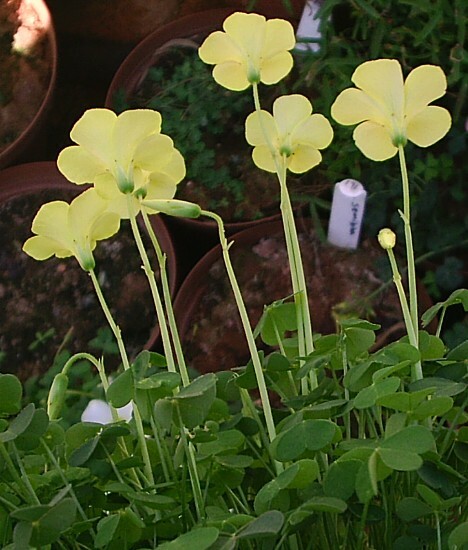 Oxalis ciliaris Jacq. is a widespread species that occurs from the Northwest and Southwest Cape to the Eastern Cape (Tulbagh to Port Elizabeth). Growing up to 30 cm, but usually shorter, in colonies, plants have a distinct stem at the base with occasional leaves on the stem. Leaves are trifoliate, terminally clustered with hairs on the midribs. They are usually folded along the middle. There is only 1 flower per stalk ranging in color from white, pink, rose, violet or salmon with a dark yellow tube. Plants flower in autumn and winter (April to July). Photo from the book Plants of the Klein Karoo courtesy of Jan and Anne Lise Schutte-Vlok. 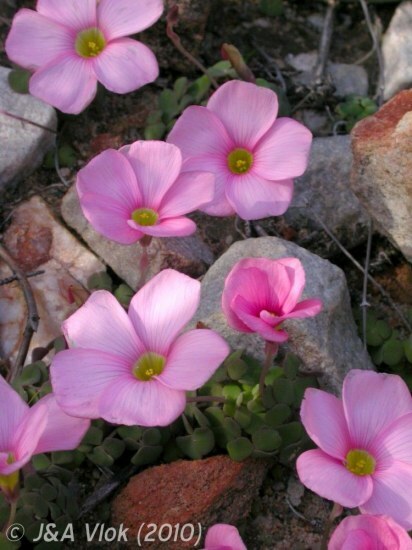 Oxalis clavifolia Sond. 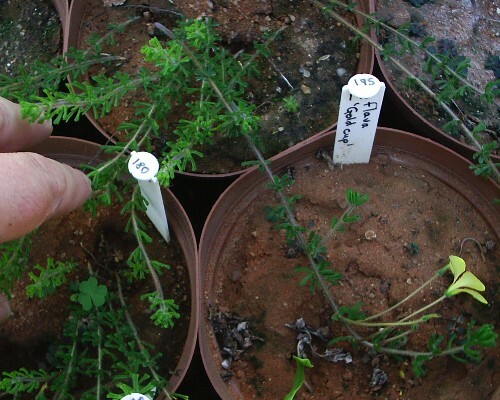 is a low growing rambling plant when grown by me, but according to the literature it should be erect when growing in its native south and western Namaqualand. 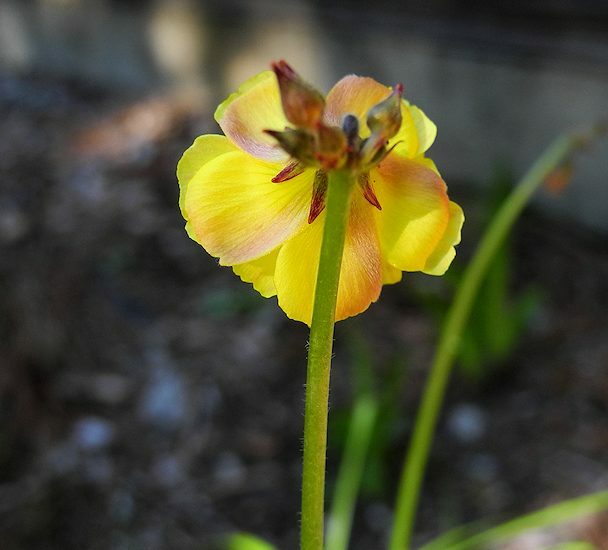 The flower is a brilliant yellow and with a purple margin on the underside. The stems are covered with viscous hairs, and the leaves club-shaped, giving rise to the latin name. Photos by Christiaan van Schalkwyk. 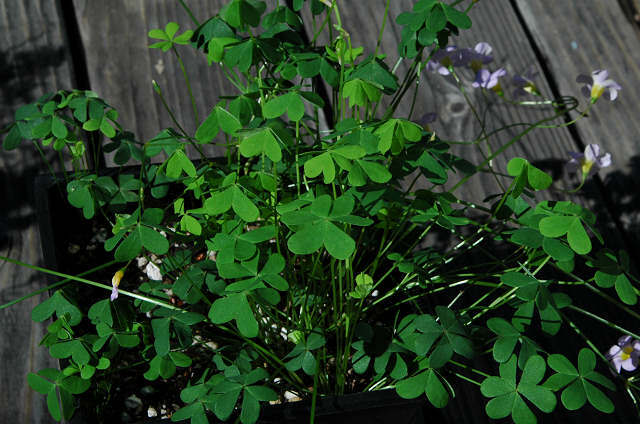 Oxalis commutata Sond. 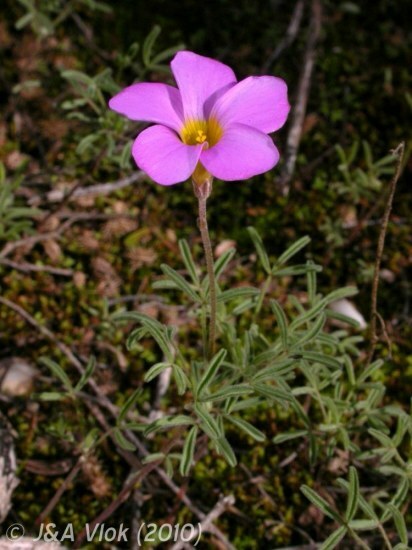 is found on the plateaus of hills and in marshy places in the western Cape. It has short-stalked rounded to heart-shaped leaves in threes that are green above and smooth and reddish-purple below. 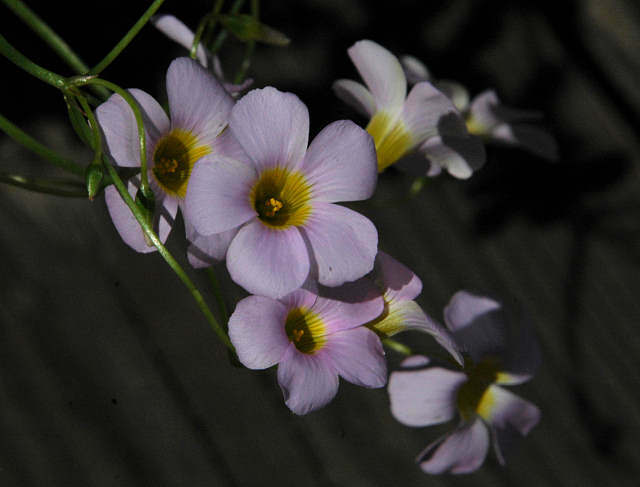 This species has rose, lilac, or white flowers with a yellow tube held above the leaves. Photos by Mary Sue Ittner. The last shows the bulbs on a 1 cm grid. MV5117, a plant collected by Michael Vassar at Vanrhynshoek, has lavender flowers held above the tiny leaves. It blooms in early fall, a few weeks after watering begins. Michael thought it to be this species. It increases rapidly so might need to be watched for weed status. Bulbs planted in the ground in Northern California are just hanging on however and not increasing. First photo by Mary Sue Ittner and second by Michael Mace. 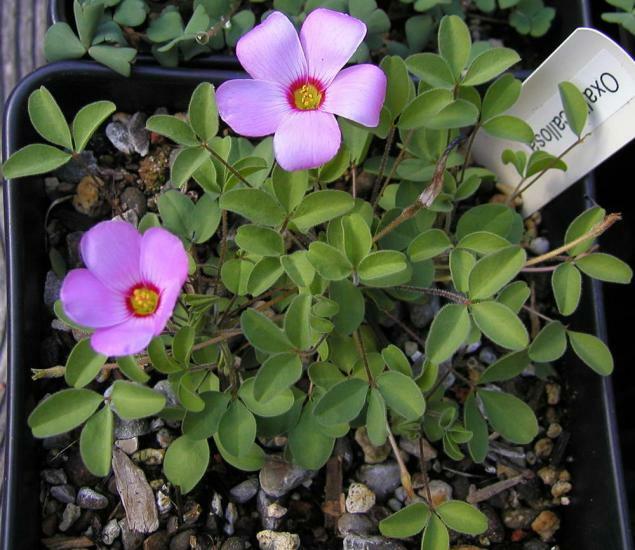 Oxalis comosa E. Mey. ex Sond. is common in Namaqualand, from Kamieskroon in the south, extending beyond Concordia in the North. The first photograph is of one from the Nababeep area (south of Springbok). It is one of the only few shade loving species, and if it grows among or in bushes can reach up to a metre in hight. Plants in sunny spots are much smaller and densely branched. 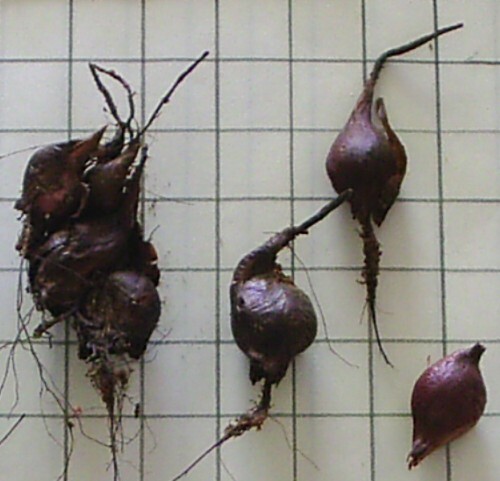 The bulb is long and spindle shaped; the bulb tunics are light brown and smooth. 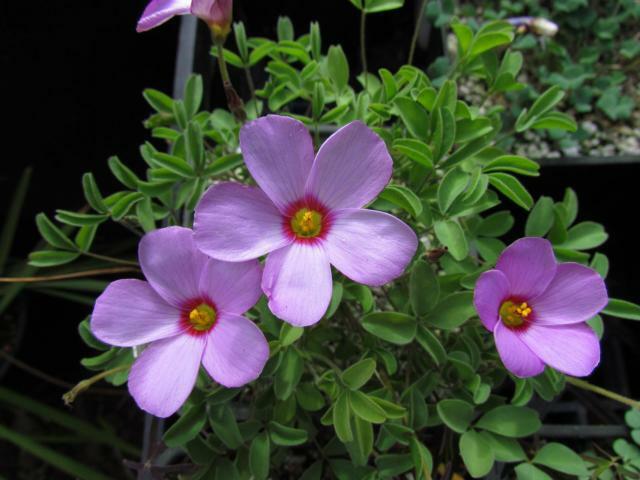 Plants grown under this name are most often not this species, but rather the large flowered form of Oxalis obtusa, which can be distinguished by its totally different growth habit and bulbs. The first photo by Christiaan van Schalkwyk. 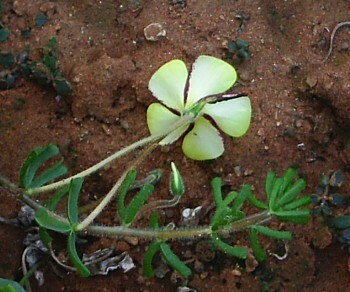 The next two were taken by Bob Rutemoeller and Mary Sue Ittner in Namaqualand September 2006. 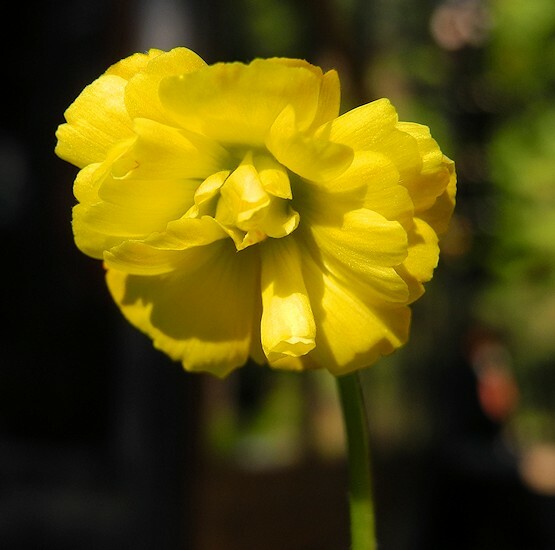 Oxalis compressa Thunb. 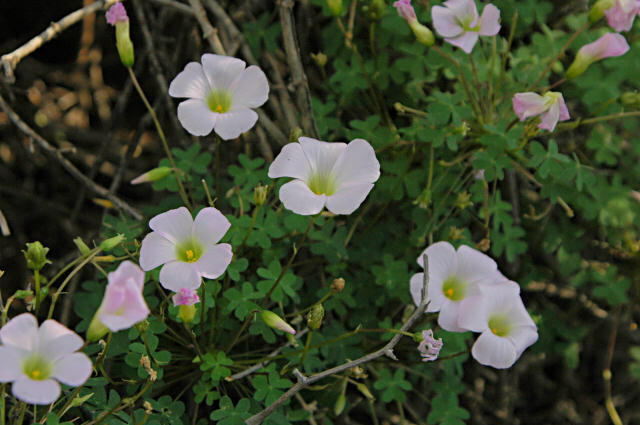 is found in the Northwest to Southwest Cape and has more than one flower in the peduncle (2-6), trifoliate leaves and compressed leaf stalks and is often confused with Oxalis pes-caprae. 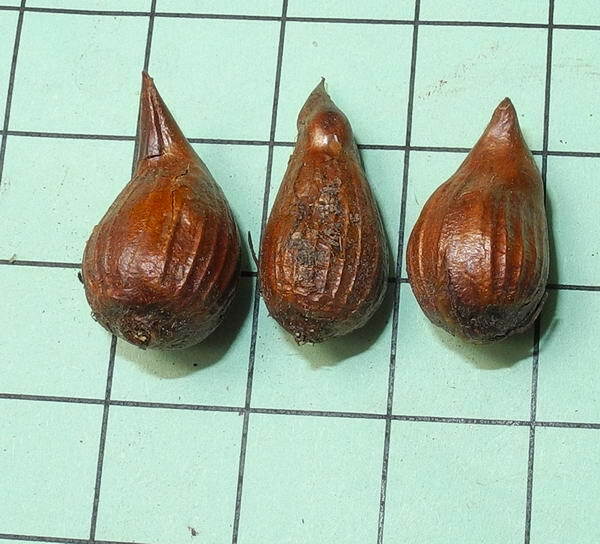 Cape Plants describes O. compressa as like O. pes-caprae, but petioles are flattened and peduncles 3-6 flowered versus 3 to 20 in O. pes-caprae. 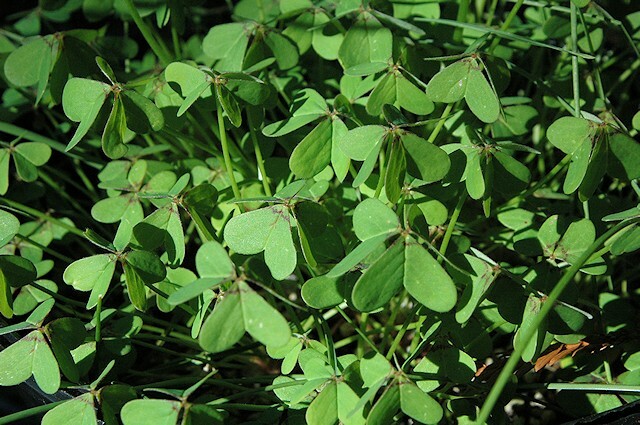 Christiaan van Schalkwyk added this distinction: Oxalis compressa can be identified by the flattened or compressed leaf stalks. 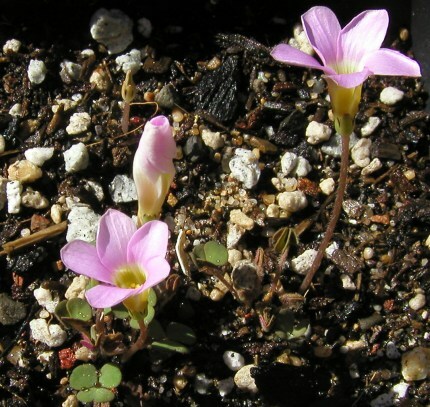 Oxalis pes-caprae has a brown bulb, without conspicuous longitudinal grooves. It may or may not have a stem. 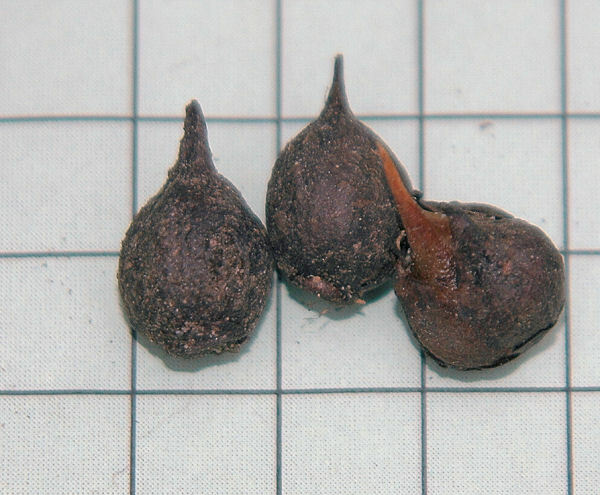 The first photo is of a plant collected by Johannes-Ulrich Urban outside Vanrhynsdorp in hard gravel. It forms a rosette of bright green leaves with reddish-brown stems and many bright yellow flowers blooming above the leaves in winter. 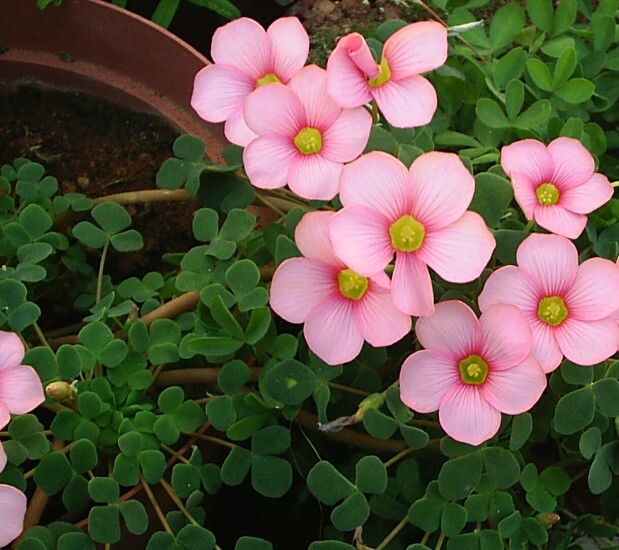 This plant, Oxalis sp. 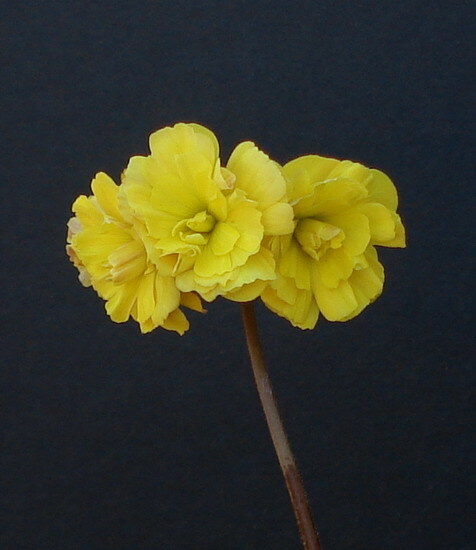 Uli63, is most likely Oxalis compressa. The last photo shows the bulbs on a 1 cm grid. Photos by Mary Sue Ittner and Bob Rutemoeller. 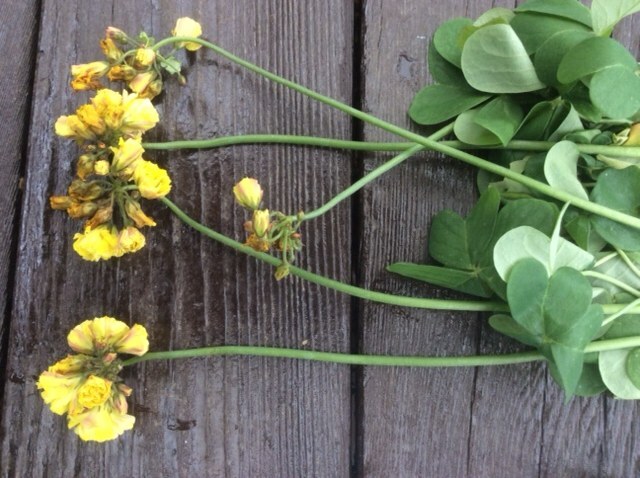 The first photo below from Ron Vanderhoff shows a form with double flowers. 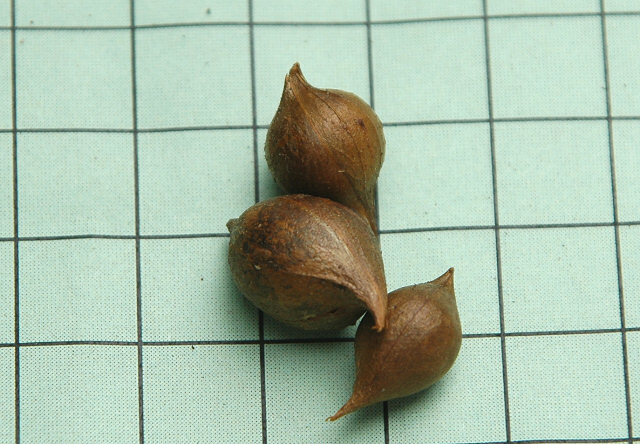 The other photos of the leaves, back, and bulbs on a 1 cm grid of a double form donated to the BX by Alberto Castillo were taken by Mary Sue Ittner. It took many years of growing the bulbs before it bloomed. It may have benefited from a deeper pot. 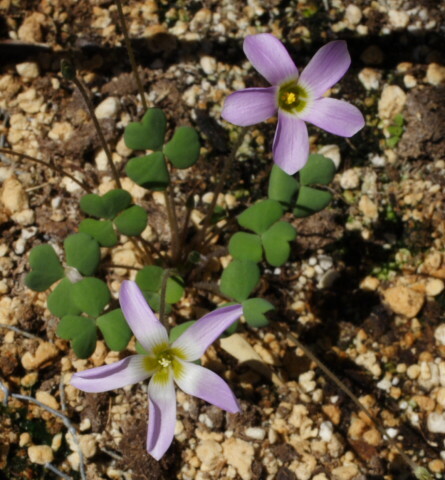 This double form is very similar to the double form of Oxalis pes-caprae and members of the PBS list in the discussion referenced below wondered if it could be that species, but it has bulbs with grooves. Regardless of which species it might be, it has the potential to be a terrible weed in the right circumstances and should not be planted out in a Mediterranean climate. See the discussion in the next paragraph below. Interestingly, the single flower species shown above does not increase very much. 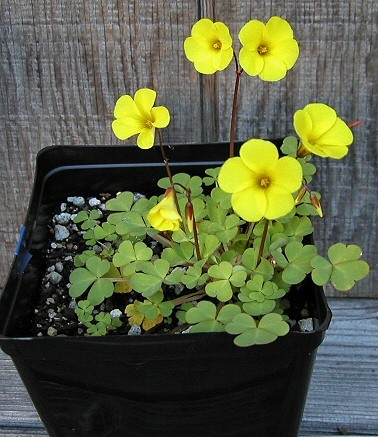 Jim Waddick writes "Here's a plant of Oxalis compressa with large double flowers, but what is going on here? 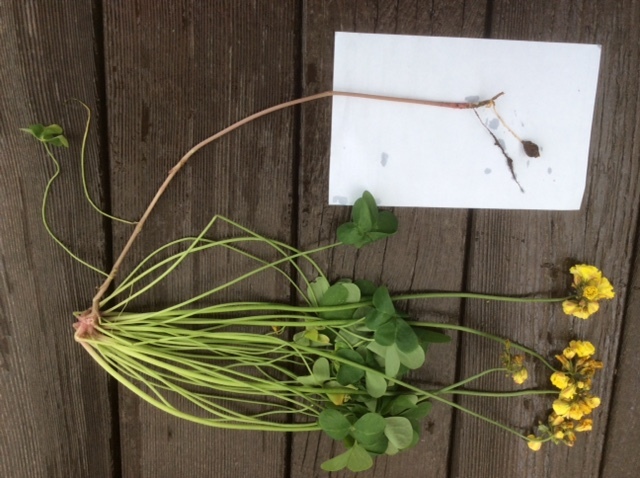 The flowers are part of a good size clump of leaves, but then there is a near leafless stem going down almost a foot to end in a tiny corm barely under the soil. Unfortunately a greenhouse weed. Notice that the clump of foliage is NOT resting on the ground and has no hint of roots. Also note the picture of the tiny tuber. 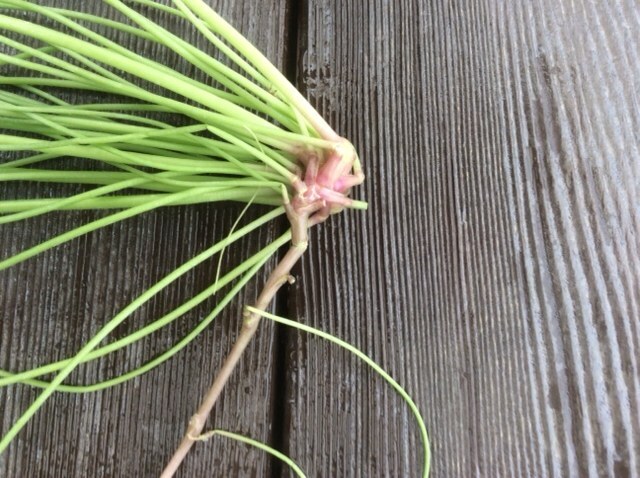 The tuber is attached to the main stem and there is a small bud just starting to develop where the tuber meets the stem. A lot of odd structures here." Jim's photos were discussed on the PBS list. Kipp McMichael explained that the plant Jim uprooted was a sprout of the bulb he pulled out. 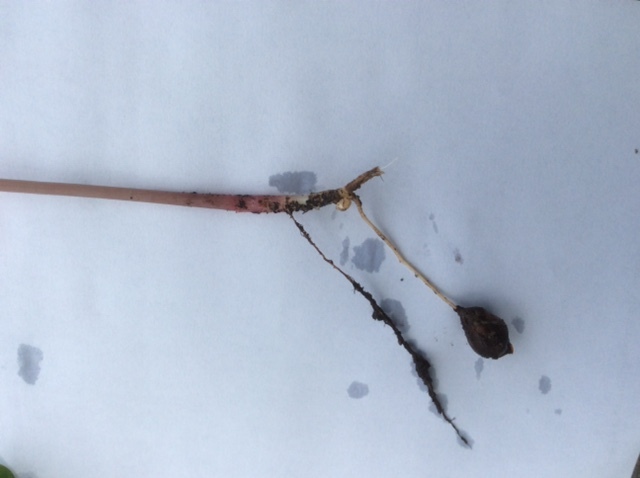 It produces a root-like shoot that grows to the surface and puts down roots with new bulbs forming along the roots. 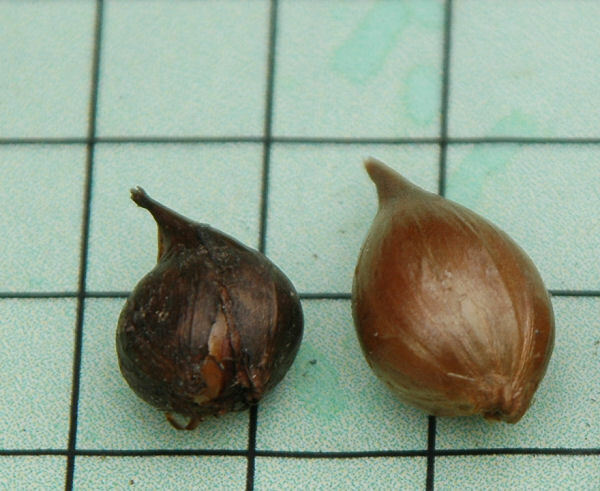 If you try to pull it out, the smaller bulbs are often left in place and appear the following year. 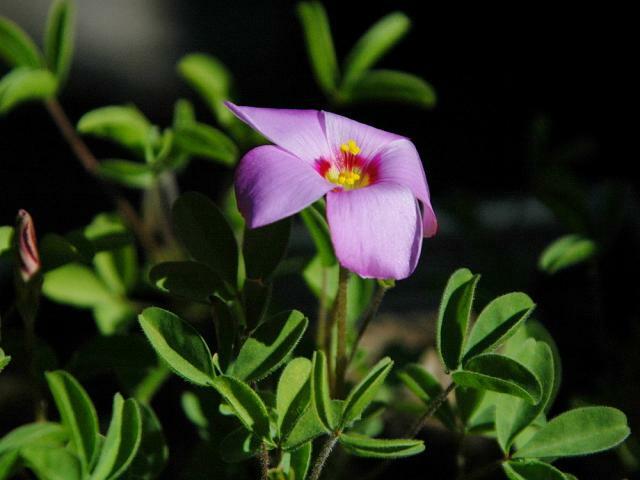 This is shown more clearly in the photos on the Oxalis pes-caprae wiki page. 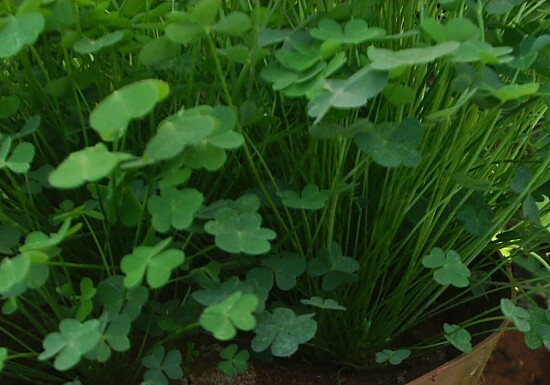 This is a feature which makes this oxalis invasive and difficult to eradicate. Photos from Jim Waddick. 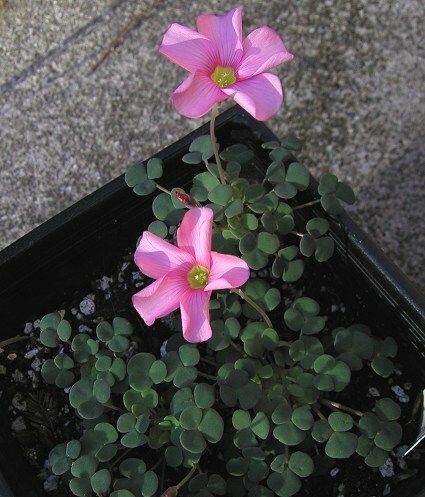 Oxalis convexula Jacq. is a winter spring bloomer with rosy-salmon flowers with a yellow throat. Leaflets are in threes, thick and fleshy. The flowers need warmth to open. 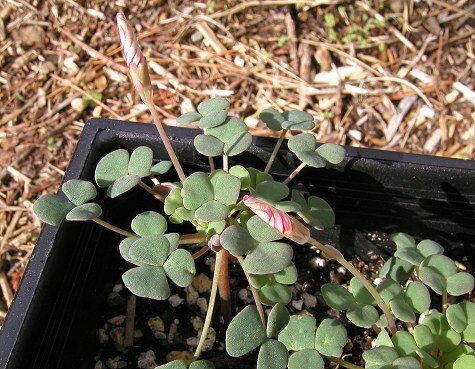 The pictures below by Mary Sue Ittner December 2003 and January 2004 are taken on different days illustrating the leaves and open buds and on a second day the buds open even more. The third picture was taken after I brought it inside where it was warmer so the flowers would open. The fourth picture is of a plant four years after its last transplant. The original single bulb managed to form about 80 bulbs in these four years. In the last picture a part of this clump and some single bulbs can be seen on a 1 cm grid. The thick fleshy stems seen in the first and fourth photos are characteristic of this species. The last two pictures were taken by Christiaan van Schalkwyk. Photos below from the book Plants of the Klein Karoo courtesy of Jan and Anne Lise Schutte-Vlok. 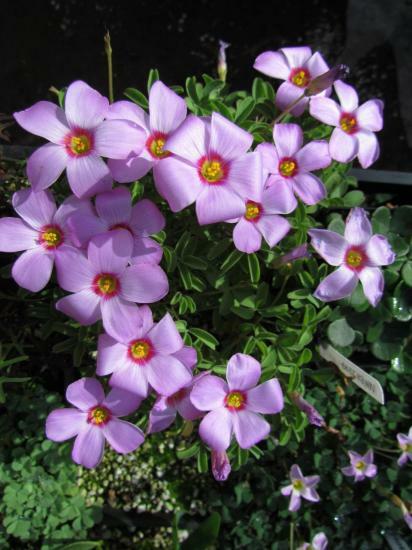 They write that plants grow up to 15 cm tall with a short stem at the base and 3 almost round succulent leaflets, and one salmon pink to orange flower with a yellow center per stalk. Andrew Wilson has posted the following caution because of his experience in southern California with this species. "There, additional warmth is present and blooming begins in October or November. 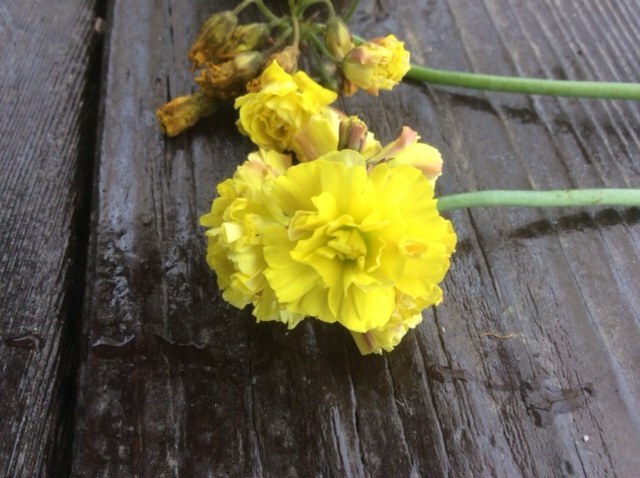 The plants form multiple small bulbils clustered about the axis of the flower stems. 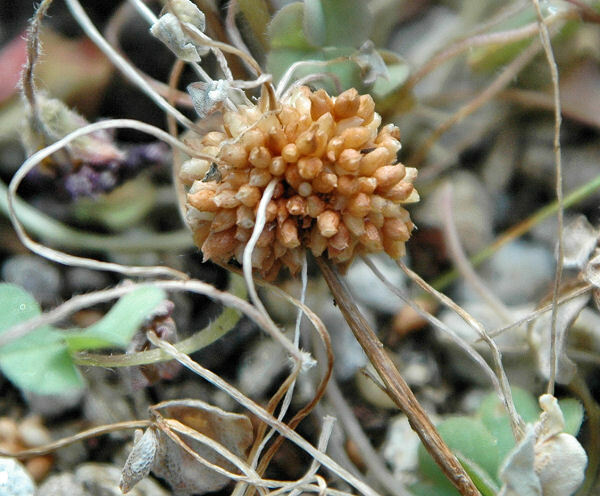 These are deposited on the ground below the plants and, in areas such as San Diego, they produce large numbers of plantlets either in spring or in the fall. If not destroyed, they produce within several months a new crop of flowering specimens. 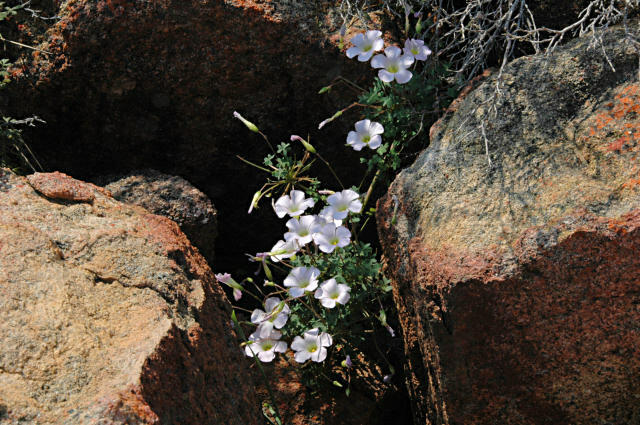 The temptation to permit this attractive species to bloom should be overcome as the weedy behavior can lead quickly to numbers that are difficult to contain." Tim Harvey, also living in Southern California, but more inland, had some planted in the ground for 7-8 years and reported it was definitely not invasive. To propagate it he had to save bulbils in the spring and plant in fall. He believed they did not survive the heat of summer. 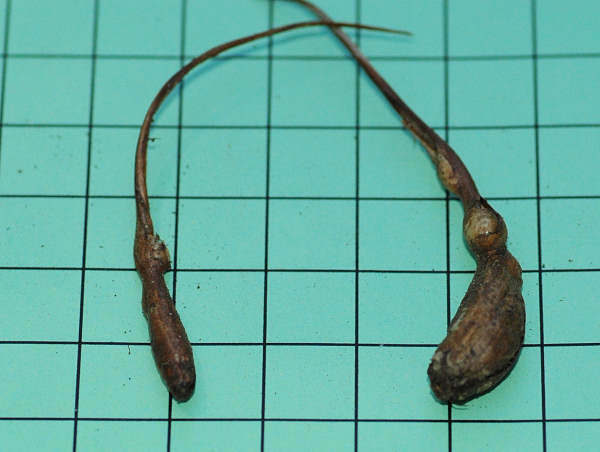 However, in his Accession Number inventory of Oxalis, Michael Vassar cautions that for each of the forms of this species listed there, many bulbils are formed. Michael lived and grew his plants just north of Los Angeles. Mary Sue Ittner in Northern California struggles to keep hers going and unlike many other species does not find there are extras to share with others. Diana Chapman who grows hers in pots in a very large greenhouse in Northern California does observe the bulbils and provides some useful guidance: " A tip for dealing with aerial bulbils produced by O. convexula and others. Vacuum them up before they have a chance to blow around." Christiaan van Schalkwyk reported that this species has never formed axial bulbs in his garden in South Africa, but noted that Salter in his monograph stated that it was such a vigorous plant, that it kept growing in between the pages of his press. He had to poison it in order to make herbarium specimens. So, the species seems to thrive under certain conditions, but not others. Photo from Mary Sue Ittner. 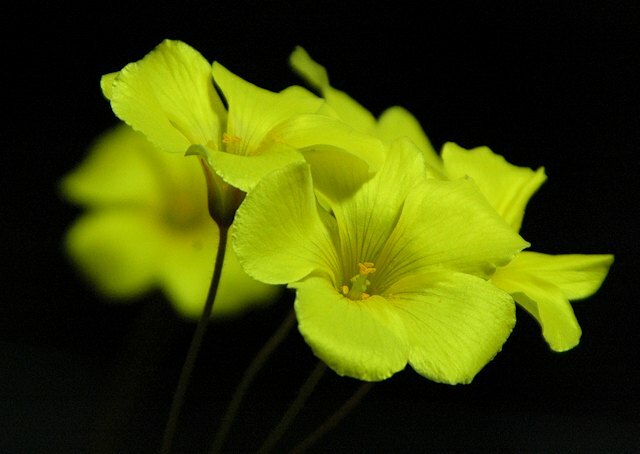 Oxalis copiosa F. Bolus is a yellow flowering species often confused with other similar species, namely Oxalis pes-caprae, Oxalis compressa and Oxalis haedulipes. 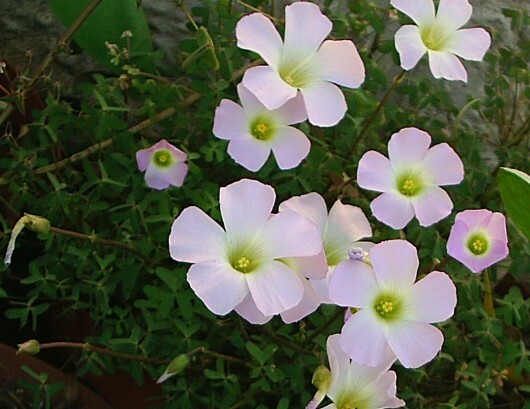 All four have umbels of yellow flowers, although Oxalis copiosa has only 1 to 2 flowers per stalk, often only one flower in the beginning of the season, later progressing to two. If there is only one flower, one can still see the upper articulation of the flower stalk set at the bracts. 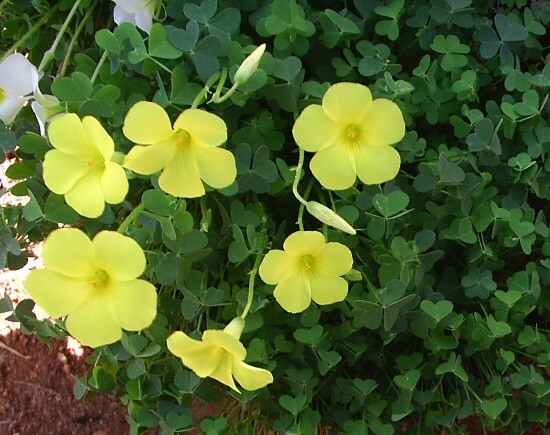 Oxalis compressa can be identified by the flattened or compressed leaf stalks. 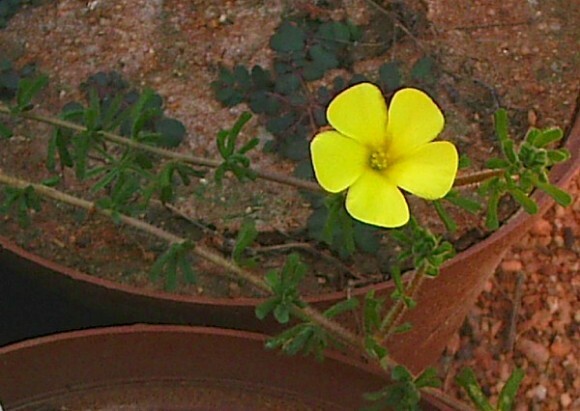 Oxalis pes-caprae has a brown bulb, without conspicuous longitudinal grooves. It may or may not have a stem. 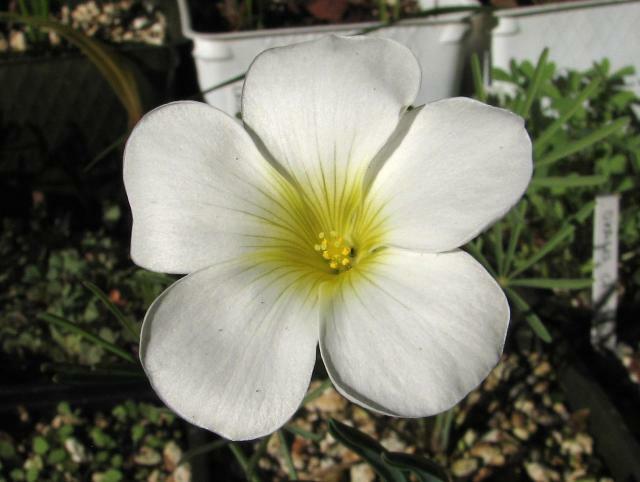 The bulbs of Oxalis copiosa and Oxalis haedulipes are similar: greyish and with conspicuous longitudinal grooves. 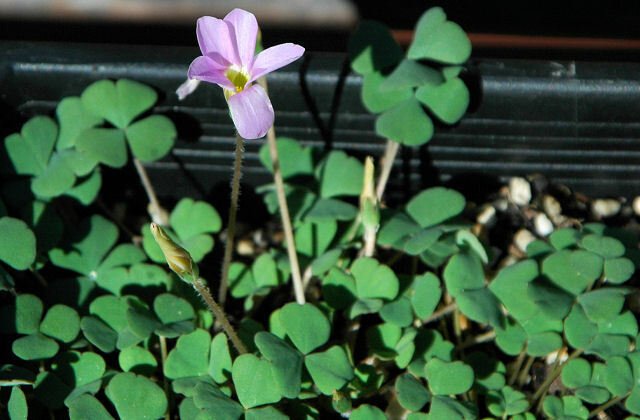 Oxalis copiosa never has a stem, while Oxalis haedulipes always has an exserted stem. 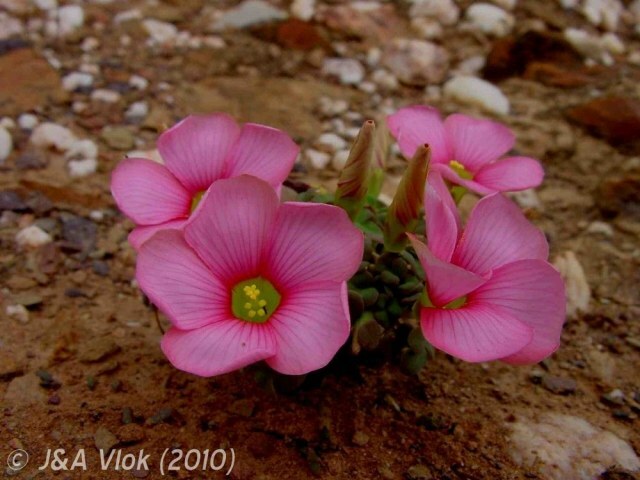 Below are photos of Oxalis copiosa from southern Namaqualand take by Christiaan van Schalkwyk.